Sedona is sensational, and intensely spiritual as well, some say sacred. Nestled among striking red sandstone formations at the south end of the 16-mile valley that is Oak Creek Canyon. Multi-hued stone formations jut upwards from the high desert floor creating a vivid, mesmerizing setting that changes hourly with the light. Surrounded by 1.8 million acres of national forest land, visitors have instant access to recreational activities. Trails for hiking and biking, along with bouncy jeep tracks, weave among the bristling forest of pinnacles, spires, buttes and domes. Yet, you’re never far from the indulgences of town. Sedona’s main attraction is its array of red sandstone formations. The formations appear to glow in brilliant orange and red when illuminated by the rising or setting sun. The red rocks form a popular backdrop for many activities, ranging from spiritual pursuits to the hundreds of hiking and mountain biking trails. Sedona is located at 34°51′36″N 111°47′21″W, which is in the Upper Sonoran Desert of northern Arizona. At an elevation of 4,500 feet (1,372 m), Sedona has mild winters and hot summers.The city has a total area of 19.2 square miles (49.7 km2), of which 0.04 square miles (0.1 km2), or 0.22%, is water. The famous red rocks of Sedona are formed by a layer of rock known as the Schnebly Hill Formation. The Schnebly Hill Formation is a thick layer of red to orange-colored sandstone found only in the Sedona vicinity. The sandstone, a member of the Supai Group, was deposited during the Permian Period. Sedona has a temperate semi-arid climate. In January, the average high temperature is 57 °F (14 °C) with a low of 31 °F (-1 °C). In July, the average high temperature is 97 °F (34 °C) with a low of 64 °F (17 °C). Annual precipitation is just over 19 inches (480 mm). Sedona is home to several notable arts organizations in Northern Arizona. Chamber Music Sedona sponsors a chamber music program annually from October to May. They also sponsor the MET: Live in HD opera broadcasts in Sedona. The Sedona Arts Center, is the oldest arts center in northern Arizona. Sedona International Film Festival & Workshop was established in 1995. The week-long annual festival takes place in late February and early March at Harkins Theatres while supplemental events take place at area resorts and restaurants. The festival also hosts monthly events. Gumption Fest, is one of the largest free music and arts festivals in Northern Arizona, according to the Sedona Red Rock News. There is a specialized New Age tourist industry in Sedona, where the “Harmonic Convergence”. Some purport that “spiritual vortices” are concentrated in the Sedona area at Bell Rock, Airport Mesa, Cathedral Rock, and Boynton Canyon. 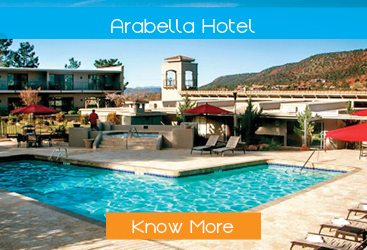 As one of the most popular destinations in the Southwest, Sedona has developed an expansive infrastructure of lodging options. They are as varied as the red rock formations themselves. Spa treatments, guest-oriented staff and exquisite dining are all designed for maximum pampering. Styles range from Southwestern haciendas to Native American pueblos to a French country inn. No matter how much time you have in Sedona, you can’t see everything. With clusters of natural wonders in every direction, it’s difficult to pin down a specific list of attractions. Have you ever wondered why Sedona is a mecca of spiritual healing? Sedona activities also include photography or painting workshops, wine-tastings, swimming in Oak Creek, kayaking down the Verde River or renting a jeep to go exploring. If you’re traveling by car, consider taking State Route (SR) 179 which is nominated as an All American Road by the FHWA, based on its natural, recreational and scenic qualities. The National Scenic Byways Program recognizes, preserves and enhances selected roads throughout the United States. Consider taking a flight to Sedona and land at one of the most picturesque airports in the country! 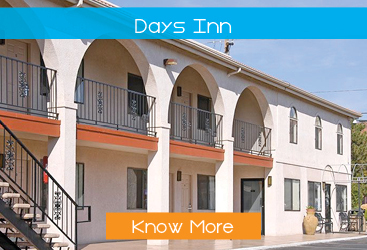 Guests of Days Inn Sedona enjoy warmly welcoming accommodations and a host of all-inclusive amenities. Relax, renew, explore in one of the most beautiful places in the world!